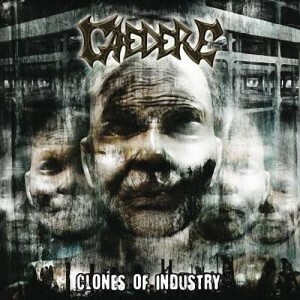 On its second album Dutch death metal band Caedere started to develop more of its own identity. Still heavily indebted to Severe Torture “Clones Of Industry” has Caedere slowly letting loose of its direct influence towards something more individual sounding. More of a refinement than a reinvention “Clones Of Industry” merely hints at what would materialize. “Clones Of Industry” solidifies the promise that Caedere was on the verge of breaking away from its inspirations and becoming its own recognizable entity. Delayed for over a year by its contractor Grotesque Production and released without a promotional campaign worthy of the name, “Clones Of Industry” should have been bigger than it ended up being. In the six years since its unassuming and fairly typical debut the band had acquired a second guitarist with Thomas Luijken, and a better understanding of where it wanted to take its music. Caedere has the misfortune of positioning itself in between the two ends of the spectrum. It has neither the hooks and grooves of “Feasting On Blood” Severe Torture, and neither the unholy riff schemes and malevolent atmosphere of early Sinister. Caedere is influenced by both, but tends to gravitate more towards the Severe Torture part of the equation. “Mass Emission” was still heavily indebted to early Severe Torture (and Cannibal Corpse, by proxy). 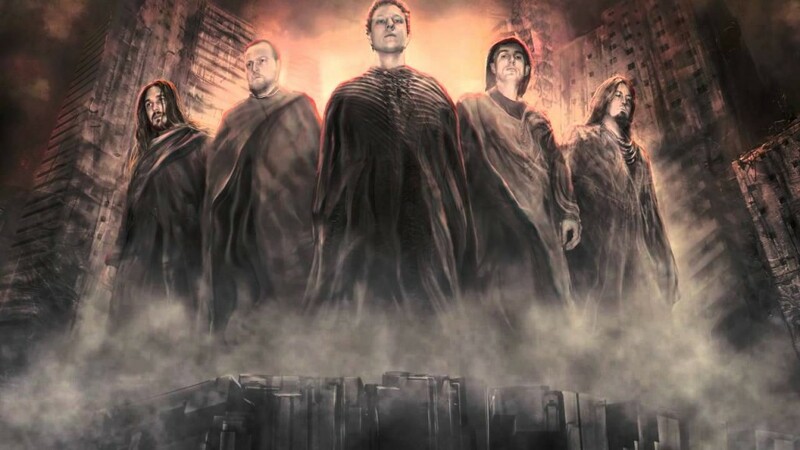 “Clones Of Industry” is marked by a light Morbid Angel influence in comparison to the debut of six years prior. The influence translates itself in better balanced song structures, and less of a focus on immediate visceral punch. The riff construction and chord progressions are still closely linked to “Feasting On Blood” and “Misanthropic Carnage” era Severe Torture. The riffing itself has become weightier, as have the transitions and the general feel of the songs. The Morbid Angel influence that defined its third album “The Lost Conveyance” is limited to a few isolated instances. Understanding that more animated lead work, a scarcity on “Mass Emission” to say the very least, was necessary to spice up its assault two tracks feature guitar solos. Adding further diversity is the bass break in ‘Reincarnation Of A Soul’. ‘Transitoriness and Oblivion’ is interesting in retrospect because of its greater Morbid Angel influence, and that it was a precursor to the band’s direction on its subsequent album “The Lost Conveyance”. Not all material on “Clones Of Industry” was new as the trio of ‘Need For Greed’, ‘Clones Of Industry’ and ‘Scorn’ were all re-recorded from the independently distributed “Promo 2007”. A more interesting evolution happened with Caedere’s choice of lyrical subject matter. “Clones Of Industry” forgoes the trite gore content of its “Mass Emission” debut in favor of a broad socio-political thematic detailing how economic – and technological advancements have forced various participants of society into a role of indentured servitude. Conceptually “Clones Of Industry” hardly offers up any novelties, or new insights into its dystopian subject of choice, but it is infinitely more interesting than the tired and tiresome gore that characterized much of its debut. The artwork by Rutger de Vries for Hrödger Design capitalizes on the subject matter with a number of interchangeable faces set to a background of a high-rise building. The album was recorded at Deusex Infernis Studio in Zutphen with Pascal Altena producing, except for the drums that were recorded at Scenic Studio in Enschede with Nico van Montfort engineering. “Clones Of Industry” was mastered by Disavowed vocalist Robbert Kok at Audiovisualz. The production choices are somewhat puzzling when it comes right to it. Caedere combines a Swedish guitar tone, decidedly Stockholm in tone, with audible bass guitar licks and an Immolation-like drum sound. Whether this production choice was done to budgetary contraints or inexperience remains to be seen. It’s an odd choice of tones that don’t mesh well, and often make the record sounds unnecessarily hostile to inexperienced listeners. What it lacks in clarity it makes up in crunch, and what it lacks in textural depth it complements in sheer concreteness. An unfortunate set of circumstances with its label resulted in the album being delayed for over a year by Spanish label Grotesque Productions. This in turn prompted the interest of American label Deepsend Records to release the album instead you could look here. Loyal to its original contract Caedere persevered with its Spanish label partner, who ended up doing zero promotion for the record. In hindsight Deepsend Records could perhaps have given “Clones Of Industry” the kind of promotion it deserved. As it stands “Clones Of Industry” is where Caedere started to show more individual character, and no longer was a mere sum of its collective influences. It was the missing link between its bog-standard beginnings and its more musically/lyrically sophisticated third offering. “The Lost Conveyance”, the third Caedere album since their formation in 1998, has the band maturing musically and lyrically. Adopting scathing socio-political subject matter, and further embracing its musicality along with its increasing technical skill. “The Lost Conveyance” merges old – and new genre traits and is helped by a meatier, concrete production, and abstract artwork. For all intents and purposes “The Lost Conveyance” is the most conceptually complete Caedere record up to this point, and their best to date. That isn’t to say that Caedere (Latin for “to kill”) completely overhauled its sound on this third outing. It is the completion of an evolution that dates back to its 2009 album “Clones Of Industry”, which was itself quite more ambitious than its “Mass Emission” debut. However said evolution never truly manifested itself in the way it does here. Where in the past Caedere sounded like an utterly massive Severe Torture (Hammerheart Records era) clone with its third album the Morbid Angel influence is far more pronounced. 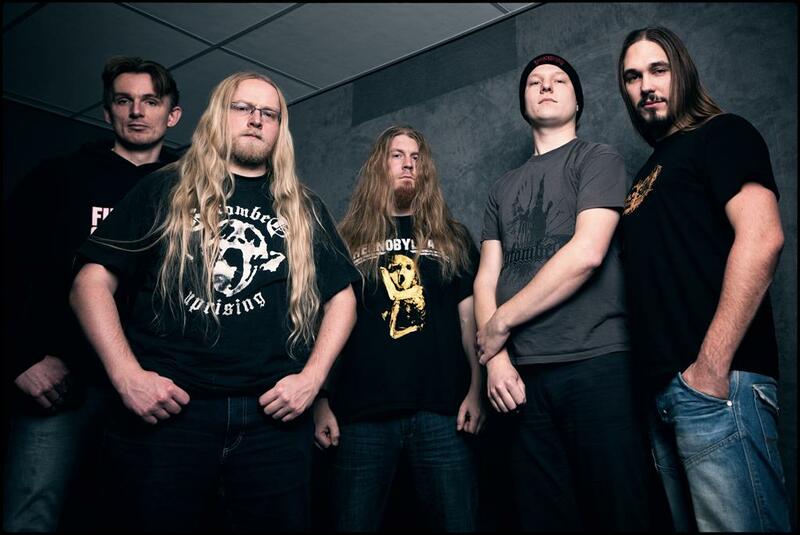 The Stockholm melodies have been toned down, and the whole bathes in an aura similar to Morbid Angel’s “Gateways to Annihilation” and Lost Soul’s “Chaostream”. In the past Caedere could be accused of blasting incessantly, but everything is better balanced compositionally on “The Lost Conveyance” than ever before with prior recordings. ‘Against Better Judgement’ sounds as something off “Gateways to Annihilation” before the acceleration in the last minute and a half. ‘Union Of Substitutes’ has some very prominent bass licks, and multiple esoteric solos through out its duration. ‘Facing Reality’ has guest vocals by Mike Hrubovcak (Divine Rapture, Monstrosity, Vile). ‘Conveyance Lost’ is an acoustic guitar interlude in the 90s death metal tradition. The more deliberately paced nature of the songs should facilitate Caedere with the room, and breathing space to integrate a few more guitar – or bass solos in future material. Given the evolution the band went through in the years between both albums it wouldn’t be too surprising to see Caedere embrace its musicality even further. On the whole the material on “The Lost Conveyance” sounds a lot more controlled, better paced, and more importantly, better written than anything this band has done before. The lyrics are intelligently written scathing examinations of contemporary society, anonym yet global, consumption – and greed driven above all else. While the lyrics spew righteous indignation at its chosen subject, they refrain from falling into expletives and insults despite its obvious frustration, and irritation with the accepted and seldomly questioned status quo. The move away from the tired and tiring gore – and into more relatable socio-political criticism is a decision that should be commended. It is always more interesting to read about subjects bands are passionate about instead of dwelling on subjects that they are supposed to write about. “The Lost Conveyance” further explores the thematic premiered on “Clones Of Industry”, and hopefully Caedere continues to explore this subject matter on future output. It certainly is far more interesting that than the gore, and mindless blasphemy that perseveres in the genre. Unlike a lot of others Caedere understands the importance of bottom-end heaviness, and “The Lost Conveyance” has an incredible crunch in regards to its concrete bass guitar and kickdrum tone, even though the snares and toms sounded better on prior records. In fact the drum tone seems to be on the only strike against “The Lost Conveyance”. Jarno Olinga proves to be a suitable replacement for original drummer Sjoerd Modderkolk as far as intensity is concerned, but doesn’t quite possess the creative chaos that Modderkolk provided behind the kit. Michiel Lankhorst is the Dutch equivalent of fomer Morbid Angel - and current Warfather vocalist Steve Tucker, or former Monstrosity frontman Jason Avery - ravagingly intense and fittingly commanding within the context of their respective bands, but regrettably forgettable outside of it also. 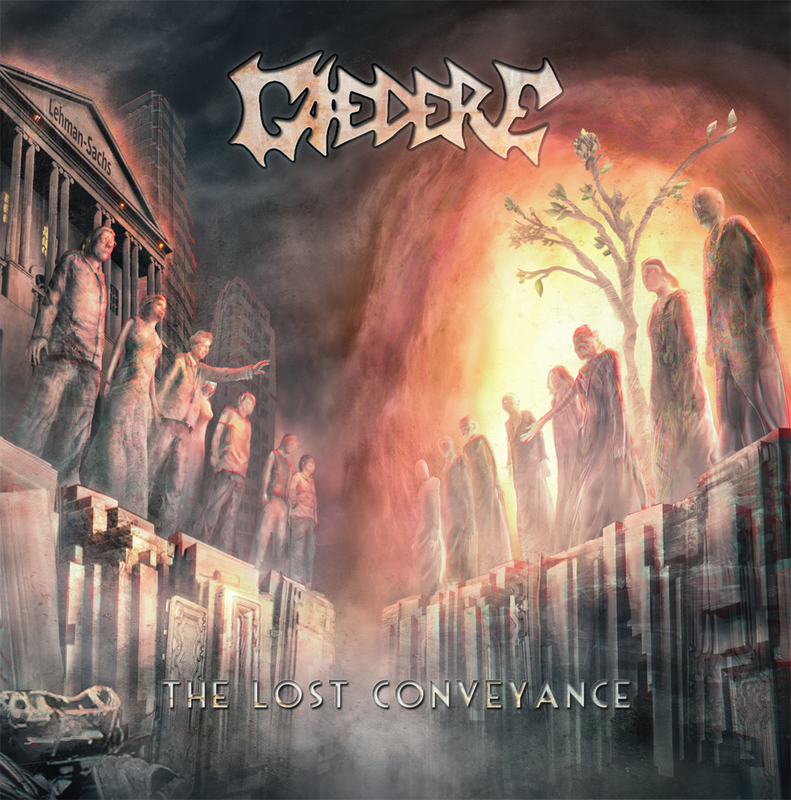 On all fronts that matter “The Lost Conveyance” represents a major leap forward with Caedere sidestepping the obvious rakes, and limitations of the death metal genre – instead pushing forwards towards something more musical, more technical, and more conceptually ambitious. The wonderful artwork by Noisecraft embraces an old school aesthetic lost on most contemporary acts in this genre. It’s hard to believe that no other label imprint was interested in this Caedere effort outside of the bottom-feeding Sevared Records, and its liege of dubious signees. If there was any justice in the industry this would have been released through Willowtip, or New Standard Elite. The improved distribution should help Caedere in terms of visibility on the North American continent.